We’ve added a new party to our Fall / Autumn party lineup … the Acorn theme! 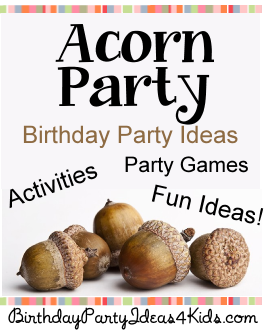 With Fall in the air what is a better party theme then Acorns?! Fun for kids, tweens and teens of all ages. Fun and easy party games that kids will love! Fall Scavenger Hunt – with a FREE list of fun Fall items to find! For more fun Fall / Autumn themes, games and activities see our Fall Party Page on the website! A harvest of party ideas!! Let Birthday Party Ideas 4 Kids help with planning your next party! Fun games, party activities, sleepover and slumber party ideas, scavenger hunts, over 200 party themes for kids, tweens and teens. We’ll help you get the party started!